Because of the numerous refractive surgery terms that are used almost exclusively in the successful understanding of refractive disorders, first presenting a glossary of terms to assist the reader is essential. Ablation - Removal. In excimer laser surgery, a frequency of energy causes corneal molecules to detach from one another from their points of attachment. ASA – Abbreviation for advanced surface ablation. A collective term sometimes used to refer to the current techniques for surface treatments. Astigmatism - A refractive condition where the surface of the cornea is not spherical. A distorted image is formed because light images focus on 2 separate points in the eye. Automated lamellar keratoplasty - An incisional refractive surgery method used in low-to-moderate myopia. An automated microkeratome placed on the eye removes, in an oscillating shaving motion, a thin layer of cornea that is microns thick. Subsequent removal of a thinner underlying corneal stroma is performed with stitchless replacement of the initial superficial cap. Laser in situ keratomileusis - A refractive laser procedure combining the use of ALK and photorefractive keratectomy in reshaping the central cornea to treat refractive errors. An automated microkeratome, similar to that used in ALK, is used to fashion a flap with a hinge. Subsequent ablation is performed on the corneal stromal bed with stitchless replacement of the corneal flap. Laser epithelium keratomileusis - A modification of the epithelial debridement performed in photorefractive keratectomy. In this procedure, the epithelium is detached with the use of an alcohol solution (usually 20%) to lyse DNA bonds (cleave basement membrane) and to soften the epithelium to facilitate rolling over into a flap. Ablation is performed subsequently with replacement of the epithelial flap. Light amplification by stimulated emission of radiation - Laser light is composed of one color (wavelength) traveling in one direction, and each light wave is traveling in step with the adjacent wave, making the laser light more powerful by a factor of millions. Photoastigmatic refractive keratectomy - Although similar to photorefractive keratectomy, the ablation profile is specific for astigmatism. Wavelength - The distance between the top of one wave and the top of the next wave. In the case of an excimer laser, this is measured in nm (eg, argon fluoride has a wavelength of 193 nm). 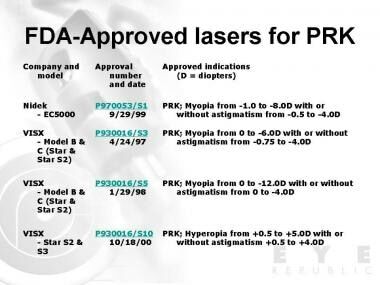 PRK is the application of ultraviolet high-energy photons (193-nm wavelength) of the ultraviolet range generated by an argon fluoride excimer laser to the anterior corneal stroma to change its curvature and, thus, to correct a refractive error. [2, 3] The physical process of remodeling by PRK is called photoablation. This surgical procedure reshapes the central cornea to a flatter shape for people who are nearsighted and a more curved surface for people who are farsighted. Several techniques are being used to correct for astigmatism. Two different methods of energy delivery are available by the excimer laser device, a large circular beam and a scanning slit or spot. The earlier devices initially used large area ablation. To date, some manufacturers still use large area ablation in their modern devices. The circular laser beam passes through a diaphragm that slowly enlarges to deliver more cumulative energy in the center and less in the periphery. [4, 5] Some laser-induced irregularities (central islands) have been reported in these large area systems. This method results in a shorter operating time to deliver the necessary laser pulses versus a system that uses a scanning slit system. The following manufacturers use circular beam lasers: Schwind (Coherent Medical Inc, Palo Alto, Calif), Summit (Waltham, Mass), [6, 7, 8] and VISX (Santa Clara, Calif). The scanning slit or spot is an alternative method of energy delivery by the excimer laser. A smaller beam passes through a beam-shaping aperture, delivering a pattern of more pulses centrally than peripherally and resulting in greater corneal tissue ablation centrally. Less total energy is delivered at the corneal surface; therefore, a less powerful laser device may be used. In principle, this system is more effective in providing different ablation patterns in the treatment of astigmatism, irregular astigmatism, and hyperopia. The use of scanning laser technology with its small moving beam has resulted in reduced thermal heating. This is visualized in a study that showed the different areas of plume production after each area of ablation following movement of the scanning beam. Central islands have not been reported in these systems. The smaller ablation size of the scanning laser consequently results in a longer operating time. Maintaining fixation has always been a problem for these scanning lasers, especially with the longer operating time, which results from more ablations by the smaller beams. Moreover, precise pulse-to-pulse registration of the scan is necessary to achieve a smooth and accurate final pattern. Automatic tracking devices are provided standard in these devices. The current techniques for surface treatments (eg, PRK, PARK, LASEK, epithelial scrubber assisted PRK, epi-LASIK) are sometimes collectively termed advanced surface ablation (ASA). The use of an Amoils epithelial scrubber allows fast and accurate epithelial removal, leaving a smoother anterior stromal surface. The quick and efficient epithelial removal in less time decreases the potential for corneal dehydration to occur. It produces an easily seen bull’s eye that aids in centration of the laser application. Less epithelium is removed, resulting in faster healing time. The history of surgical treatment for astigmatism dates back to the late 1800s. Certain milestones in the development of this procedure can be attributed to several individuals, and a number of parallel procedures were in development at certain time periods. In 1885, Schiotz performed limbal incision in the steep meridian to reduce iatrogenic astigmatism. Faber performed anterior transverse incisions to reduce idiopathic astigmatism. Lucciola also performed nonperforating corneal incisions to correct astigmatism. In 1894, Bates postulated that corneal incisions made at right angles to steeper meridians might correct astigmatism. Later, Lans showed that flattening in the meridian perpendicular to a transverse incision was associated with steepening in the orthogonal meridian and that a greater effect may be achieved with deeper and longer incisions. In the 1940s, Sato began an extensive investigation of radial and astigmatic keratotomy. Fyodorov is responsible for presenting several nonperforating anterior keratotomy patterns. Modern techniques for astigmatic keratotomy are attributed to the works of Nordan, Thornton, and Nichamin. Nordan advocated a simple method of straight transverse keratotomy, with a target correction of 1-4 diopters (D). Thornton proposed a technique that included up to 3 pairs of arcuate incisions in varying optical zone sizes and with consideration of age and timing after surgery, respectively. Nichamin developed an extensive nomogram for astigmatic keratotomy at the time of cataract surgery, although this technique has been modified by the use of a limbal relaxing incision during cataract surgery. Consequently, Troutman, who fancied wedge resection for reduction of postcorneal transplant astigmatism, developed another technique of astigmatism reduction. Increased interest in using lasers to ablate tissue occurred in the late 1980s. The excimer laser initially was developed to etch out inscriptions on microchips. The postulated application of controlled ablation on corneal tissue led to its use in refractive correction. In the late 1990s, wavefront aberrometry promised both physicians and patients the potential to achieve the so-called supervision. Initially used by astronomers, this wavefront technology reduced unwanted wavefront distortions in the creation of land-based telescopes. Refractive errors (ie, myopia, hyperopia, astigmatism) can decrease visual acuity. Astigmatism is a more challenging entity because it is determined by regularity, amount, and orientation. It also is more difficult to treat than myopia or hyperopia. The quest to treat astigmatism began with the use of nonsurgical devices, including spectacles and contact lenses. These nonsurgical devices were followed by surgical techniques involving astigmatic keratotomy, compression sutures, and wedge resection. Newer surgical procedures include the use of intracorneal ring segments, PARK, LASIK, and LASEK, with or without wavefront-guided technology. Clinically detectable refractive astigmatism reportedly is present in as many as 9 out of 10 eyes. However, refractive astigmatism in most of these eyes would not be clinically significant. The incidence of clinically significant astigmatism has been reported to be 7.5-75%, a wide range that primarily depends on the specific study and an author's definitions. Studies have estimated that approximately 44% of the population has more than 0.50 D of astigmatism, 10% of the population has more than 1.00 D, and 8% of the population has 1.50 D or more. Reportedly, astigmatism of at least 1.00 D often results after extracapsular cataract extraction, and astigmatism of at least 3.00 D is present in as many as 20% of cases with 10-mm incisions. Even phacoemulsification procedures, using the clear cornea technique, reportedly cause postoperative astigmatism, thereby guiding the cataract surgeon as to the proper placement of the corneal approach. High astigmatism can occur after penetrating keratoplasty. The means of ablation of the excimer laser seem to be photochemical in type. This removal of tissue is called photochemical ablation or ablative photodecomposition. Photochemical ablation is an extremely confined tissue interaction centered on the fact that every photon created by the ArF excimer laser has 6.4 eV of energy, which is sufficient to split covalent bonds. The intramolecular bonds of uncovered organic macromolecules are split when a sufficient number of high-energy, 193-nm photons are absorbed in a brief period. The resulting fragments rapidly expand and are ejected from the exposed surface at supersonic velocities observed under high-resolution magnification as the plume effect. This is the reason why only the irradiated organic materials are affected and the adjacent areas are not affected. A patient with astigmatism may complain of shadowing, bending, loss of contrast, and distortion. Astigmatism is believed to be the most common cause of ametropia. In mild cases, it may cause blurring of vision and ghosting. In more advanced cases of untreated astigmatism, amblyopia may be noted. Astigmatism may occur naturally (idiopathic) or secondary to surgical procedures (iatrogenic), such as cataract extraction and penetrating keratoplasty. Several clinical procedures may be performed to detect astigmatism. These procedures include automated and/or manifest refraction, keratometry, Placido ring reflections, corneal topography, and wavefront aberrometry. Despite the clear-cut indications released by the FDA, several authorities and high-volume surgeons in and out of the United States are continuing to challenge the guidelines. An increasing number of presentations are being made at conventions and in journals stating the success achieved in cases performed beyond that which is listed in the FDA guidelines. 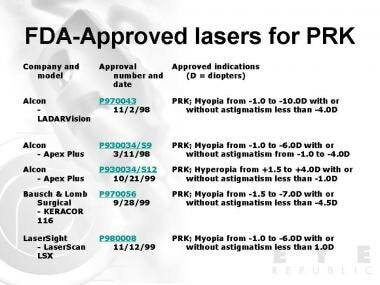 The images below illustrate current FDA-approved lasers for PRK and other refractive surgeries. 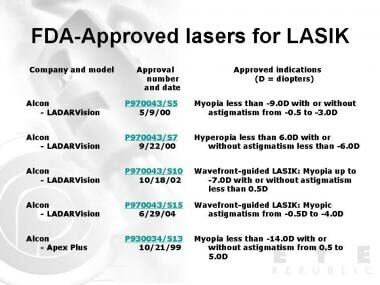 Food and Drug Administration (FDA)-approved lasers for photorefractive keratectomy (PRK). Adapted from US Food and Drug Administration - Center for Devices and Radiological Health - LASIK Eye Surgery. 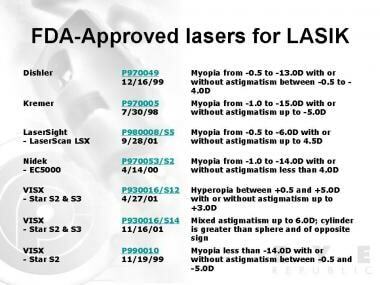 The images below outline current FDA-approved lasers for LASIK with or without astigmatism. 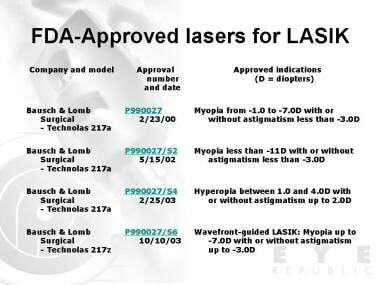 Food and Drug Administration (FDA)-approved lasers for laser in situ keratomileusis (LASIK) with or without astigmatism. Adapted from US Food and Drug Administration - Center for Devices and Radiological Health - LASIK Eye Surgery. The cornea is a transparent, avascular tissue that is continuous with the opaque sclera and semitransparent conjunctiva. It is covered by tear film on its anterior surface and bathed by aqueous humor on its posterior surface. In adults, the cornea measures 11-12 mm horizontally and 9-11 mm vertically. The average corneal thickness is 0.5 mm (500 µm) centrally and 0.7 mm (700 µm) peripherally. Contraindications to PRK are similar to that of LASIK and other refractive surgery procedures. PRK is contraindicated in patients with collagen vascular, autoimmune, or immunodeficiency diseases; those with signs of keratoconus; patients taking isotretinoin or amiodarone hydrochloride; or those who are pregnant or breastfeeding. PRK is not recommended in patients with a history of ophthalmic herpes simplex or herpes zoster. Caution should be undertaken in deciding to perform PRK or other refractive surgery procedures on patients with systemic diseases (eg, connective tissue disease, diabetes, severe atopic disease, immunocompromised status) that are likely to affect wound healing. Safety and efficacy have not been established for these patient populations. Despite these contraindications, non-recommendations, and cautions, several high-volume surgeons continue to "push the envelope" and perform these procedures beyond the FDA guidelines. Several reports exist of procedures performed on patients with forme fruste keratoconus and amiodarone toxicity. Sedghipour M, Sorkhabi R, Mostafaei A. Wavefront-guided versus cross-cylinder photorefractive keratectomy in moderate-to-high astigmatism: a cohort of two consecutive clinical trials. Clin Ophthalmol. 2012. 6:199-204. [Medline]. Seiler T, McDonnell PJ. Excimer laser photorefractive keratectomy. Surv Ophthamol. 1995. 40:89-118. Kasetsuwan N, Puangsricharern V, Pariyakanok L. Excimer laser photorefractive keratectomy and laser in situ keratomileusis for myopia and astigmatism. J Med Assoc Thai. 2000 Feb. 83(2):182-92. [Medline]. Carones F, Brancato R, Morico A, Venturi E, Gobbi PG. Compound myopic astigmatism correction using a mask in-the-rail excimer laser delivery system. Preliminary results. Eur J Ophthalmol. 1996 Jul-Sep. 6(3):221-33. [Medline]. Shah S, Smith RJ, Pieger S, Chatterjee A. Effect of an elliptical optical zone on outcome of photoastigmatic refractive keratectomy. J Refract Surg. 1999 Mar-Apr. 15(2 Suppl):S188-91. [Medline]. Danjoux JP, Fraenkel G, Lawless MA, Rogers C. Treatment of myopic astigmatism with the Summit Apex Plus excimer laser. J Cataract Refract Surg. 1997 Dec. 23(10):1472-9. [Medline]. Eggink CA, de Boo TM, Lemmens WA, Deutman AF. Photorefractive keratectomy with an ablatable mask for myopic astigmatism. J Refract Surg. 1999 Sep-Oct. 15(5):550-5. [Medline]. Thompson KP, Steinert RF, Stulting RD. Photorefractive keratectomy with the Summit excimer laser: The phase III U.S. results. Corneal Laser Surgery. 1995. 57-63. Taylor HR, Kelly P, Alpins N. Excimer laser correction of myopic astigmatism. J Cataract Refract Surg. 1994. 20:S243-S251. Tasindi E, Talu H, Ciftci F, Acar S. Excimer laser photorefractive keratectomy (PRK) in myopic astigmatism. Eur J Ophthalmol. 1996 Apr-Jun. 6(2):121-4. [Medline]. Vinciguerra P, Epstein D, Azzolini M, Radice P, Sborgia M. Algorithm to correct hyperopic astigmatism with the Nidek EC-5000 excimer laser. J Refract Surg. 1999 Mar-Apr. 15(2 Suppl):S186-7. [Medline]. Ohashi Y, Takahashi K, Yorii H. Photorefractive keratectomy for myopia and photoastigmatic keratectomy for astigmatism. J Refract Surg. 1997 Aug. 13(5 Suppl):S452-3. [Medline]. Molina R, Monasterio R, Soliz E, Foianini J. Correction of astigmatism using positive and negative cylinder programs with the Nidek EC-5000 excimer laser. J Refract Surg. 1999 Mar-Apr. 15(2 Suppl):S195-6. [Medline]. MacRae SM, Peterson JS, Koch DD, Rich LF, Durrie DS. Photoastigmatic refractive keratectomy in myopes. Nidek US Investigators Group. J Refract Surg. 2000 Mar-Apr. 16(2):122-32. [Medline]. Huang D, Stulting RD, Carr JD, Thompson KP, Waring GO 3rd. Multiple regression and vector analyses of laser in situ keratomileusis for myopia and astigmatism. J Refract Surg. 1999 Sep-Oct. 15(5):538-49. [Medline]. Vinciguerra P, Camesasca FI, Bains HS, Trazza S, Albe E. Photorefractive keratectomy for primary myopia using NIDEK topography-guided customized aspheric transition zone. J Refract Surg. 2009 Jan. 25(1 Suppl):S89-92. [Medline]. Vidaurri-Leal JS, Helena MC, Talamo JH, Abad JC, Alexandrakis G, Cantu-Charles C. Excimer photorefractive keratectomy for low myopia and astigmatism with the Coherent-Schwind Keratom. J Cataract Refract Surg. 1996 Oct. 22(8):1052-61. [Medline]. Spadea L, Verrecchia V. Effectiveness of scraping and mitomycin C to treat haze after myopic photorefractive keratectomy. Open Ophthalmol J. 2011. 5:63-5. [Medline]. [Full Text]. Amoils SP. Using a Nidek excimer laser with a rotary epithelial brush and corneal chilling: clinical results. J Cataract Refract Surg. 1999 Oct. 25(10):1321-6. [Medline]. Herrmann WA, Hillenkamp J, Hufendiek K, et al. Epi-laser in situ keratomileusis: comparative evaluation of epithelial separation with 3 microkeratomes. J Cataract Refract Surg. 2008 Oct. 34(10):1761-6. [Medline]. Hondur A, Bilgihan K, Hasanreisoglu B. A prospective bilateral comparison of epi-LASIK and LASEK for myopia. J Refract Surg. 2008 Nov. 24(9):928-34. [Medline]. Kollias A, Ulbig MW, Spitzlberger GM, et al. Epi-LASIK using the Amadeus II microkeratome: evaluation of cut quality using light and electron microscopy. J Cataract Refract Surg. 2007 Dec. 33(12):2118-21. [Medline]. Hays J, Thornton S. Astigmatism, Astigmatic Keratotomy. Medscape Reference. [Full Text]. Kapadia MS, Krishna R, Shah S, Wilson SE. Arcuate transverse keratotomy remains a useful adjunct to correct astigmatism in conjunction with photorefractive keratectomy. J Refract Surg. 2000 Jan-Feb. 16(1):60-8. [Medline]. Kaye SB, Patterson A. Association between total astigmatism and myopia. J Cataract Refract Surg. 1997 Dec. 23(10):1496-502. [Medline]. Yi DH, Petroll M, Bowman RW, McCulley JP, Cavanagh HD. Surgically induced astigmatism after hyperopic and myopic photorefractive keratectomy. J Cataract Refract Surg. 2001 Mar. 27(3):396-403. [Medline]. Nguyen NX, Langenbucher A, Viestenz A, Kuchle M, Seitz B. Correlation among refractive, keratometric and topographic astigmatism after myopic photorefractive keratectomy. Graefes Arch Clin Exp Ophthalmol. 2000 Aug. 238(8):642-6. [Medline]. Bansal AK. Photoastigmatic refractive keratectomy for correction of astigmatism after keratoplasty. J Refract Surg. 1999 Mar-Apr. 15(2 Suppl):S243-5. [Medline]. Bilgihan K, Ozdek SC, Akata F, Hasanreisoglu B. Photorefractive keratectomy for post-penetrating keratoplasty myopia and astigmatism. J Cataract Refract Surg. 2000 Nov. 26(11):1590-5. [Medline]. Tabin GC, Alpins N, Aldred GF, McCarty CA, Taylor HR. Astigmatic change 1 year after excimer laser treatment of myopia and myopic astigmatism. Melbourne Excimer Laser Group. J Cataract Refract Surg. 1996 Sep. 22(7):924-30. [Medline]. Onclinx T, Smith RJ, Maloney RK. Induced astigmatism after photorefractive keratectomy. J Cataract Refract Surg. 1999 Feb. 25(2):183-7. [Medline]. Kapadia MS, Krishna R, Shah S, Wilson SE. Surgically induced astigmatism after photorefractive keratectomy with the excimer laser. Cornea. 2000 Mar. 19(2):174-9. [Medline]. Myrowitz EH, Kurwa A, Parker J, Chuck RS. Wavefront-guided photorefractive keratectomy after radial keratotomy in nine eyes. J Refract Surg. 2009 May. 25(5):470-2. [Medline]. Cagil N, Ugurlu N, Cakmak HB, Ilker Kocamis S, Turak D, Simsek S. Photorefractive keratectomy in treatment of refractive amblyopia in the adult population. J Cataract Refract Surg. 2011 Dec. 37(12):2167-74. [Medline]. American Academy of Ophthalmology. Excimer laser photorefractive keratectomy (PRK) for myopia and astigmatism. American Academy of Ophthalmology. Ophthalmology. 1999 Feb. 106(2):422-37. [Medline]. American Society of Cataract and Refractive Surgery. Abstracts. 2001 Apr-May. Goggin M. PRK for myopia and astigmatism. Ophthalmology. 2000 May. 107(5):814-6. [Medline]. Serrao S, Lombardo G, Lombardo M, Palombi M, Roberts CJ. Corneal topography six years after photorefractive keratectomy for myopia and myopic astigmatism. J Refract Surg. 2009 May. 25(5):451-8. [Medline]. Barreto J Jr, Netto MV, Reis A, Nakano M, Alves MR, Bechara SJ. Topography-guided (NIDEK customized aspheric treatment zone) photorefractive keratectomy with mitomycin C after penetrating keratoplasty for keratoconus: case report. J Refract Surg. 2009 Jan. 25(1 Suppl):S131-5. [Medline]. Roberts CJ, Zuger BJ. The Advantage and Principle of Dual Scheimpflug Imaging for Analyzing the Anterior Segment of the Human Eye. Ziemer Group. Available at http://www.ziemergroup.com/fileadmin/media/products/GALILEI/Roberts__Galilei_2006.pdf. Accessed: January 28, 2014. Higa H, Liew M, McCarty C, Taylor H. Predictability of excimer laser treatment of myopia and astigmatism by the VISX Twenty-Twenty. Melbourne Excimer Laser Group. J Cataract Refract Surg. 1997 Dec. 23(10):1457-64. [Medline]. Vinciguerra P, Epstein D, Radice P, Azzolini M. Long-term results of photorefractive keratectomy for hyperopia and hyperopic astigmatism. J Refract Surg. 1998 Apr. 14(2 Suppl):S183-5. [Medline]. Heng WJ, Chan WK, Tseng P, Balakrishnan V, Low CH. Photorefractive keratectomy for the treatment of compound myopic astigmatism using the ablatable mask. Ann Acad Med Singapore. 1997 Jul. 26(4):401-4. [Medline]. al-Abdulla NA, Jabbur NS, O'Brien TP. Astigmatism outcomes following spherical photorefractive keratectomy for myopia. J Refract Surg. 1998 Nov-Dec. 14(6):610-4. [Medline]. Alio JL, Artola A, Ayala MJ, Claramonte P. Correcting simple myopic astigmatism with the excimer laser. J Cataract Refract Surg. 1995 Sep. 21(5):512-5. [Medline]. Alpins NA, Tabin GC, Adams LM, Aldred GF, Kent DG, Taylor HR. Refractive versus corneal changes after photorefracive keratectomy for astigmatism. J Refract Surg. 1998 Jul-Aug. 14(4):386-96. [Medline]. Siganos DS, Popescu CN, Siganos CS, Pistola G. Tear secretion following spherical and astigmatic excimer laser photorefractive keratectomy. J Cataract Refract Surg. 2000 Nov. 26(11):1585-9. [Medline]. Vinciguerra P, Sborgia M, Epstein D, Azzolini M, MacRae S. Photorefractive keratectomy to correct myopic or hyperopic astigmatism with a cross-cylinder ablation. J Refract Surg. 1999 Mar-Apr. 15(2 Suppl):S183-5. [Medline]. Detorakis ET, Siganos DS, Kozobolis VP, Pallikaris IG. Corneal epithelial wound healing after excimer laser photorefractive and photoastigmatic keratectomy (PRK and PARK). Cornea. 1999 Jan. 18(1):25-8. [Medline]. Randleman JB, White AJ Jr, Lynn MJ, Hu MH, Stulting RD. Incidence, outcomes, and risk factors for retreatment after wavefront-optimized ablations with PRK and LASIK. J Refract Surg. 2009 Mar. 25(3):273-6. [Medline]. Snibson GR, McCarty CA, Aldred GF, Levin S, Taylor HR. Retreatment after excimer laser photorefractive keratectomy. The Melbourne Excimer Laser Group. Am J Ophthalmol. 1996 Mar. 121(3):250-7. [Medline]. Smolek MK, Oshika T, Klyce SD, Maeda N, Haight DH, McDonald MB. Topographic assessment of irregular astigmatism after photorefractive keratectomy. J Cataract Refract Surg. 1998 Aug. 24(8):1079-86. [Medline]. Stevens JD. Astigmatic excimer laser treatment: Theoretical effects of axis misalignment. Eur J Implant Refract Surg. 1994. 6:310-318. Jalali S, Yuen LH, Boxer Wachler BS. Effect of nepafenac sodium 0.1% on delayed corneal epithelial healing and haze after photorefractive keratectomy: retrospective comparative study. J Cataract Refract Surg. 2008 Sep. 34(9):1542-5. [Medline]. Yan W, Kanxing Z, Tong Z, et al. Photoastigmatic refractive keratectomy or laser in situ keratomileusis for moderate and high myopic astigmatism. J Refract Surg. 2000 Mar-Apr. 16 (Suppl):S268-S271. Fraunfelder FW, Wilson SE. Laser in situ keratomileusis versus photorefractive keratectomy in the correction of myopic astigmatism. Cornea. 2001 May. 20(4):385-7. [Medline]. Gabrieli CB, Pacella E, Abdolrahimzadeh S, Regine F, Mollo R. Excimer laser photorefractive keratectomy for high myopia and myopic astigmatism. Ophthalmic Surg Lasers. 1999 Jun. 30(6):442-8. [Medline]. Gimbel HV, Stoll SB. Photorefractive keratectomy with customized segmental ablation to correct irregular astigmatism after laser in situ keratomileusis. J Refract Surg. 2001 Mar-Apr. 17(2 Suppl):S229-32. [Medline]. Koshimizu J, Dhanuka R, Yamaguchi T. Ten-year follow-up of photorefractive keratectomy for myopia. Graefes Arch Clin Exp Ophthalmol. 2010 Dec. 248(12):1817-25. [Medline]. Kremer I, Gabbay U, Blumenthal M. One-year follow-up results of photorefractive keratectomy for low, moderate, and high primary astigmatism. Ophthalmology. 1996 May. 103(5):741-8. [Medline]. Kim YJ, Sohn J, Tchah H, Lee CO. Photoastigmatic refractive keratectomy in 168 eyes: six-month results. J Cataract Refract Surg. 1994 Jul. 20(4):387-91. [Medline]. Lazzaro DR, Haight DH, Belmont SC, Gibralter RP, Aslanides IM, Odrich MG. Excimer laser keratectomy for astigmatism occurring after penetrating keratoplasty. Ophthalmology. 1996 Mar. 103(3):458-64. [Medline]. Gallinaro C, Toulemont PJ, Cochener B, Colin J. Excimer laser photorefractive keratectomy to correct astigmatism. J Cataract Refract Surg. 1996 Jun. 22(5):557-63. [Medline]. Hamberg-Nystrom H, Fagerholm PP, Tengroth BM. One-year follow-up of photoastigmatic keratectomy (PARK) with the VISX 20/20 excimer laser. Ophthalmic Surg Lasers. 1996. 27:S499-S502. Gomez de Liano MZ, Jimenez-Alfaro I, Carreras I. Photorefractive keratectomy for myopic astigmatism using the emphasis erodible mask. J Refract Surg. 1995. 11:S343-S348. Cherry PM. Treatment of astigmatism associated with myopia or hyperopia with the holmium laser: second year follow-up. 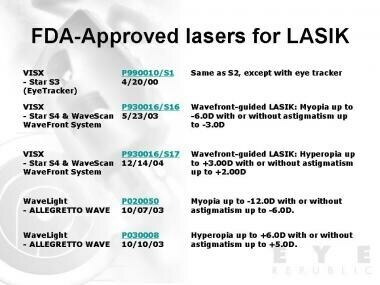 Ophthalmic Surg Lasers. 1996 May. 27(5 Suppl):S493-8. [Medline]. Cherry PM, Tutton MK, Bell A. Treatment of myopic astigmatism with photorefractive keratectomy using an erodible mask. J Refract Surg. 1994. 10:S239-S245. Hersh PS. Correction of myopia and astigmatism using an ablatable mask. J Refract Corneal Surg. 1994. 10:S250-S254. Hersh PS, Abbassi R. Surgically induced astigmatism after photorefractive keratectomy and laser in situ keratomileusis. Summit PRK-LASIK Study Group. J Cataract Refract Surg. 1999 Mar. 25(3):389-98. [Medline]. Brancato R, Carones F, Venturi E, Morico A, Gobbi PG. Photorefractive keratectomy for compound myopic astigmatism with an eye cup erodible mask delivery system. J Refract Surg. 1996 May-Jun. 12(4):501-10. [Medline]. Niles C, Culp B, Teal P. Excimer laser photorefractive keratectomy using an erodible mask to treat myopic astigmatism. J Cataract Refract Surg. 1996 May. 22(4):436-40. [Medline]. Kaskaloglu M. Early results of photorefractive keratectomy for myopic astigmatism. J Refract Surg. 1996 Feb. 12(2):S258-60. [Medline]. Dausch D, Klein R, Landesz M, Schröder E. Photorefractive keratectomy to correct astigmatism with myopia or hyperopia. J Cataract Refract Surg. 1994 Mar. 20 Suppl:252-7. [Medline]. Dausch DG, Klein RJ, Schröder E, Niemczyk S. Photorefractive keratectomy for hyperopic and mixed astigmatism. J Refract Surg. 1996 Sep-Oct. 12(6):684-92. [Medline]. Astigmatic ablation profile. Image courtesy of Manolette Roque, MD, Ophthalmic Consultants Philippines Co, EYE REPUBLIC Ophthalmology Clinic. Myopic ablation profile. Image courtesy of Manolette Roque, MD, Ophthalmic Consultants Philippines Co, EYE REPUBLIC Ophthalmology Clinic. Hyperopic ablation profile. Image courtesy of Manolette Roque, MD, Ophthalmic Consultants Philippines Co, EYE REPUBLIC Ophthalmology Clinic. Technolas 217z excimer laser. Digital photo published with permission from Bausch & Lomb Surgical Philippines. Orbscan IIz. Digital photo published with permission from Bausch & Lomb Surgical Philippines. ZyWave wavefront aberrometer. Digital photo published with permission from Bausch & Lomb Surgical Philippines. ZyWave wavefront aberrometer user interface. Digital photo published with permission from Bausch & Lomb Surgical Philippines. Fixation with ZyWave wavefront aberrometer. Digital photo published with permission from Bausch & Lomb Surgical Philippines.